Cordless Drill/Impact Driver for Home use. 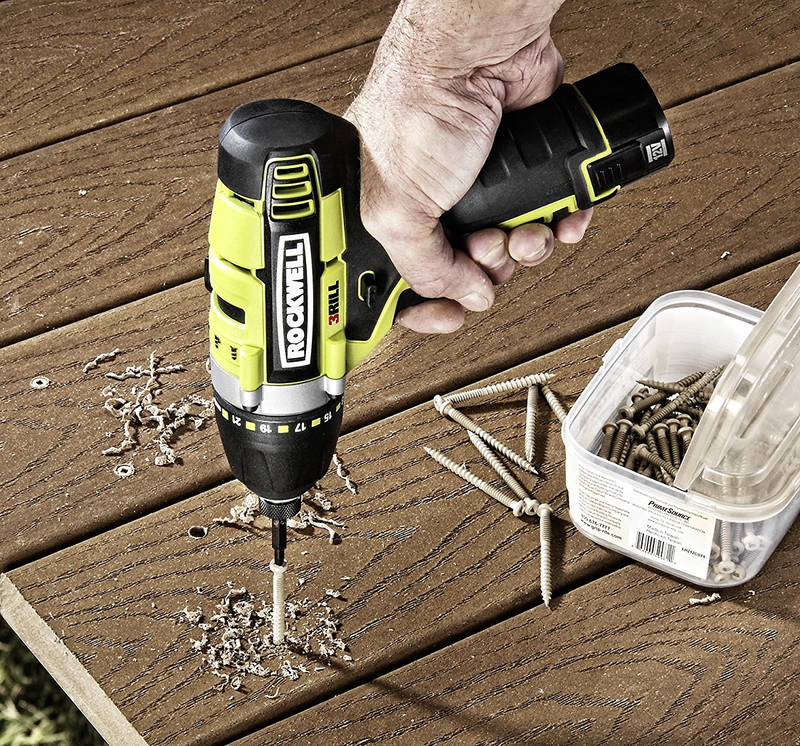 Can’t decide whether you want a cordless drill, a cordless screw driver or a cordless impact driver? Now, you don’t have to decide, because the Rockwell drill 3 in 1 Cordless Drill/Driver/Impact Driver combines all three into one tool. This combo unit has a 4-position selector switch on top of the unit that allows switching between two standard drilling speeds, screwdriver and impact drill. Essentially you can handle the workload of the three different styles of drill with this one unit. While there is some room for improvement, it represents a solid tool available at a good price. Variable speed control for speeds of 0-600 RPM (screwdriver), 0-2200 (impact driver) and 0-600/0-2200 (Lo/Hi drill). Max torque of 800 in-lbs in impact mode (150 in-lbs in drill mode). Drilling capacity of 7/8-inches in wood and 5/16-inches in steel. 30-minute charging time with the included charger on the 12-volt Lithium-Ion batteries. Covered by Rockwell’s 2-year limited warranty. Rockwell RK2515K2 goes out of the world with its features that are made sure by brilliant lithium technology. It has a 12-volt battery which comes with a smart cheap that is a favourite product of the same brand. It takes only 30 minutes and it will last longer than any other batteries in the market. Their brand is confident with their battery quality of this model so why they gained amazing consumers trust. They said that they like to give lifetime warranty for and battery replacements. This shoes their confidence about this product that nobody gives. 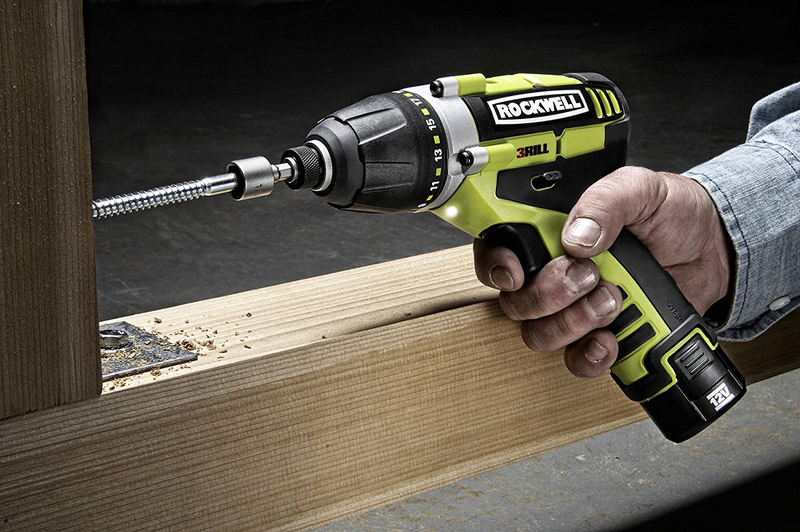 The Rockwell drill 3 in 1 Cordless Drill/Impact Driver is likely one of the most versatile cordless drill units on the market. Having the combination of all three of the most popular cordless drill variations in one tool may make this unit a keeper. The 1/4-inch hex-style col-let (instead of a 3/8-inch 3-jaw chuck) is becoming more widely used by drill manufacturers, and 1/4-inch hex-style bits are readily available. The advantage of the quick-change hex-style col-let far outweighs the advantages of the more traditional chuck (which can slip and loosen, allowing bits to fall out of the chuck). While there are a few improvements I’d like to see (a little bit better balance, as the unit is somewhat front-heavy, a brighter LED light and so on), there’s not a lot to complain about. The unit comes with a few bits, two batteries and a 30-minute charger, all in a soft-side case that is big enough to carry a few other small items along with the drill, charger and batteries. If you don’t like to spend for both drill and impact driver, then this machine is a good one for you. Now, I like to give you some tips to make sure that your working job with this drill is even more exceptional than usual times. You will get two batteries when you buy this drill. You just need one battery for your machine and keep safe another battery. 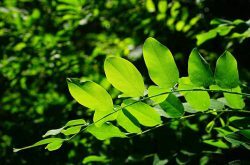 What you can do is, you can later alter them and use these batteries together with the device. Hope this will increase the battery life and will improve your productivity. Tags: cordless drillCordless Drill/Impact Driver for Home use.cordless driverdrill 3 in 1 Cordless Drill/Impact Driver for Home use.Rockwell drill 3 in 1 Cordless Drill/Impact Driver for Home use.